In this book, leading prophetic voice Jennifer LeClaire guides readers along the journey of a prophet– from the initial call all the way through to maturity. This process is anything but easy. But LeClaire offers honest, accessible counsel to help you move into your prophetic call. Her spiritual insights will help you overcome the fear of man, identify and eliminate wrong motives and, above all, pursue intimacy with God. Many prophets are called . . . but not everyone endures the making process; to his or her prophetic destiny. God is looking for people to entrust with the secrets of His heart. Embrace the journey toward your call with this comprehensive, practical guide, and experience the awesome process of being formed into a mouthpiece for the God of the universe. 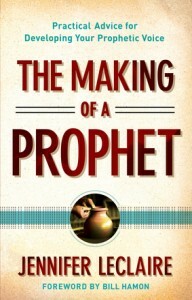 I have read many books on this topic and The Making of a Prophet was the best I’ve read thus far. When I first selected this book to review, I was on the fence about it. Since the other books I read were a disappointment. This book was different than all the other books I’ve read on this subject. The Making of a Prophet is a practical and biblical guide to what it truly is to be used of God as a prophet and also, the great responsibility and cost that is associated with this office. LeClaire does not sugar coat anything. She tells it like it is. She derives and shares from her own personal experiences; the mistakes as well as the victories. Her writing style is honest, down to earth and real which I find refreshing in this day and age. Especially with so many today in the prophetic ministry, who call themselves “prophets” and go around using, abusing and exploiting their so-called gift for their own personal gain, status or recognition. *I received a complimentary copy of this book from the publisher in exchange for a review. Jennifer LeClaire is a prophetic voice and teacher with a growing media ministry. She directs IHOP-Fort Lauderdale and serves as news editor of Charisma magazine. In addition, she writes one of Charisma‘s most popular prophetic columns, “The Plumb Line,” and frequently contributes to Charisma‘s Prophetic Insight newsletter. Her media ministry includes her website, 40,000 followers on Facebook, Twitter, YouTube, and a growing newsletter list. She lives in south Florida. Learn more at www.jenniferleclaire.org.